Home » Blog » Why Try VBAC (Vaginal Birth After Cesarean Section)? The pros and cons of Vaginal Birth After Cesarean Section (VBAC) are well-documented. Both sides have merit and so, as with most things, it becomes an individual decision whether to try labor again after having had a cesarean previously. Following are a few other factors to consider when deciding if VBAC is right for you. With a VBAC, the baby picks his birthday. It is unusual for a baby to come too early or too late, most babies are right on time. There is no way for us to know if the baby has completed its intricate maturation process when we pick the day of birth. I have delivered babies at Morristown Medical Center that were 2 weeks late that look 2 weeks early and vice versa. Labor often goes WAY better the second time even with a bigger baby. We have seen women VBAC easily after a first labor that had all the “hallmark” signs of cephalopelvic disproportion. We would have never guessed it could go so well. We now think there is no predicting who will VBAC but know from the data that 60-80% will be able to successfully accomplish it. Almost everyone is a good candidate for VBAC and so deserve the opportunity to give it a try. The original cause for the cesarean section is much less likely to happen. Many first time moms have cesareans because the baby is breech or persistently Occiput posterior (sunny side up). This is much less likely to happen with a second pregnancy because the uterine muscle is thinner and abdominal muscles are weaker. Women pregnant the second time usually have a toddler to chase and toys to pick up, and are not reclining on the sofa. All 3 of these changes contribute to a baby being able to assume a much better position before labor begins. Once in labor, you can always change your mind. A decision to give a second labor a try does not mean that you cannot have a change of heart along the way. If you see this labor going the same way as the last or you just don’t feel good about it anymore, there is nothing wrong with changing your birth plan at that point. You really don’t know how many children you might want until you start your family. Current recommendations say that because every cesarean is associated with increasing risk to the mother’s health, she should limit her family to 2 or 3 children (source). Most people think 2-3 children is plenty! But what if you want more? How incredibly disappointing would it be to not have a large family because continued cesarean births would threaten the mother’s life. You feel fabulous the day after the birth. I frequently remind women working toward their VBAC “keep going, you are going to feel great TOMORROW!” The day after my own first VBAC, I was astounded when I realized just how good I felt. I had a very long, natural labor and birth, I had an episiotomy and a postpartum hemorrhage and yet I felt a million times better than the day after my cesarean. Since my daughter was born in a birth center, I was already at home, sitting outside watching my 2 year old play less than 24 hours after my birth. You can care for your other child at home much more easily. You must consider, when contemplating VBAC and repeat cesarean section, that now you have a child or two at home needing care. Having to put their lives on hold and having to arrange for lots of extra help at home while you recover from major abdominal surgery is tough for everyone involved. The risk is less than you think and the risk for other complications are just as high. The risk of a major complication with VBAC is 0.3-1%. The risk of placental abruption is also 0.3-1%, the risk of placenta previa with NO previous cesarean is 0.35-0.46% and the regular risk of postpartum hemorrhage is 1-5%. Abruption, placenta previa, abnormal implantation of the placenta and hemorrhage are increasingly more likely and more severe with each cesarean. I would be remiss if I didn’t mention that MIDWIVES’ care decreases the need for the first cesarean. If you desire to try VBAC, Midwives are usually great advocates for a Vaginal Birth After Cesarean. The decision whether or not to try laboring again is a decision best made by the woman, her husband and her provider. There is no decision that eliminates all risk but there is one that feels right for you and your family. To learn more about VBAC, visit our VBAC page or call the office and we would be more than happy to schedule some time to sit with you and discuss your options. 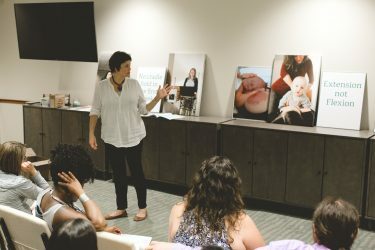 We host a weekly Midwife Orientation for new clients in our Women’s Wellness Classroom. During this time, we discuss our practice, the midwife philosophy of care, birth options and answer any questions you may have about our practice or birth. To reserve a spot contact us today.